InfluencerUpdate.biz has teamed up with esports and streaming analytics firm Stream Hatchet to bring you weekly charts of the most popular games and creators in the streaming space. This chart documents the most watched channels by hours across Twitch, YouTube Gaming, Mixer and Facebook. Each week we'll be documenting the top ten most watched channels across all the major streaming platforms, so you can see which creators are growing and which ones are in decline. The chart also shows what games they play the most. Check out our chart covering the top ten most watched games of the week here. We'll also document the top ten rising channels of the week. These are the creators that are rising fastest on their respective platforms. Twitch channel PGL_Dota2 is leading the chart this week after a huge 236 per cent increase in views. 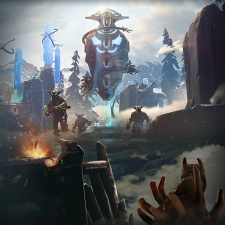 This Dota 2 focused channel entered the chart in ninth last week. Dota2mc_ru is second this week with a 200 per cent increase in views, after entering the chart at number eight last week. This channel is also providing Dota 2 esports coverage. Ninja is in third this week, losing his crown to the two aforementioned Dota 2 channels. 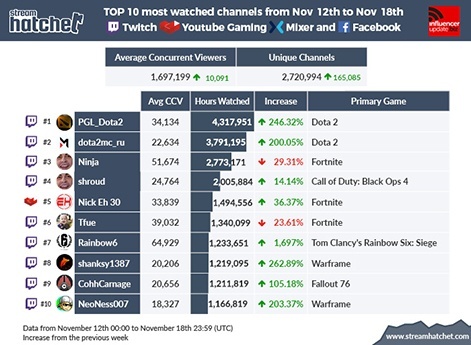 Shroud is in fourth place after a 14 per cent increase in views. Fortnite-focused Nick Eh 30 is the only YouTube Gaming channel in the chart this week, with a 36 per cent increase in views. Twitch Fortnite player Tfue is close behind in sixth despite a 23 per cent decrease in views. Twitch channel Rainbow6 is in seventh place after a whopping 1697 per cent growth in views this week. The channel is providing coverage of the Rainbow Six: Siege pro league. Shanksy1387 is a new addition to the chart this week. NeoNess007 is also on the chart after a 203 per cent increase in views. Both of these Twitch channels are Warframe-focused and their growth could be attributed to the recent surge of interest in Warframe itself. 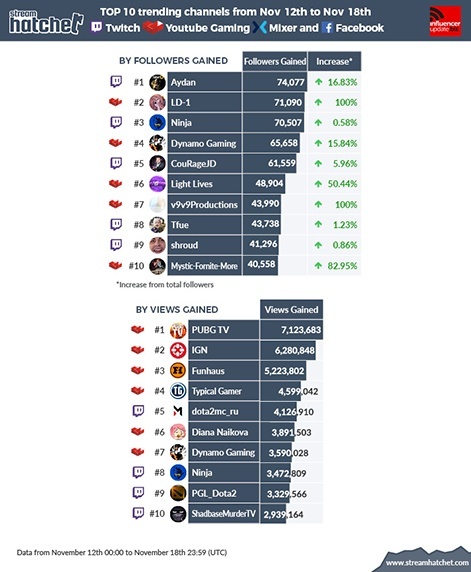 Twitch channel Aydan is leading the trending by followers chart this week. The channel is Fortnite-focused and increased its follower count by 16 per cent this week. Other new entries include YouTube channel LD-1, a Russian channel covering Dota 2, and v9v9 productions, a trending YouTube channel that doesn't actually have any content on it. So that's fun. YouTube channel PUBG TV is leading the views chart this week, providing compilations of wild PUBG plays. Returning entries to this chart include IGN, Dynamo Gaming, Ninja and PGC_Dota2. However, ShadbaseMurderTV is a new entry to the chart this week after racking up 2.9 million views. It's a medium-sized channel with just over 100k followers that seems to have drummed up some fresh views with some Fallout: 76 coverage.